212 Fifth Avenue PH, New York, NY 10010 | Sotheby's International Realty, Inc.
$58,000,000 5 Bedrooms5 Full / 3 Partial Baths10,079 sq. ft.
A historic masterpiece of its time, the Crown Penthouse at 212 Fifth Avenue is in a class of its own and the most magnificent trophy residence on Madison Square Park. Designed by Pembrooke and Ives and spanning three floors, with over 10,000SF of living space and 5,730SF of terraces, this 5-bedroom penthouse has the majestic proportions of a palace. With four exposures providing 56’ of frontage along the Park and vistas of downtown Manhattan’s most coveted architecture, the pre-war details inside are equally matched with the iconic views revealed by its elegant arched windows. The foyer opens into a dramatic atrium with its breathtaking bronze staircase as its centerpiece. The Crown’s ceiling height, coupled with its gallery-sized walls, make this penthouse an art collector’s paradise. From the marble foyer with its private elevator, to the unrivalled grand ballroom, to the library with a marble and glass fireplace, to the sumptuous 7-room master suite – every detail was considered in its conception. The second level boasts a sky-lit entertaining space and colossal outdoor oasis extending the full length of the building. The 4700+/-SF terrace, with its copper molding and painstakingly constructed parapet provides unmatched privacy. The third-floor observatory opens onto a 950SF terrace with spectacular panoramic views of the Empire State Building, Flatiron Building and World Trade Center. All the finest quality materials, smart home technology and luxury amenities were incorporated to create a regal lifestyle for the first owner of this outstanding residence. 212 Fifth Avenue condominium is the unmistakable beacon on Madison Square Park. Amenities include: 24-hour doorman and concierge services, state-of-the-art fitness room, golf simulator, screening room, children’s playroom and more. Staff quarters and storage rooms are available for purchase. This is an opportunity of a lifetime. Realtor.com, "Jeff Bezos Is Apartment Hunting in NYC—Here's What the World's Richest Man Can Buy"
Beverly Hills Magazine, "Fit For Royalty: 212 Fifth Ave Crown Penthouse NYC"
Forbes, "A $58 Million Penthouse Added Two New Floors To Its Building"
Real Estate Weekly, "Have You Heard?" Metro, "What UK Government Could Have Bought for Less Than £12,000,000 in New York"
Mansion Global, "Decorating With Velvet"
City Realty, "This Week's Most Dramatic Price Cuts Include Fifth Avenue PH with $15.8M Reduction"
Boat International, "The Fabulous New York City Homes for Sale Right Now"
The New York Times, "Manhattan’s New Luxury Skyscrapers Continue to Fill Up"
Off the Mrkt, "Our Favorite Historic Buildings Around New York City"
City Realty, "Top Manhattan Residential Sales of the Week Span New Designs and Timeless Classics"
The Real Deal, "These Are Some of the Most Notable Resi Sales Last Week"
City Realty, "New York's Most Beautiful Pre-War Condo Buildings by Neighborhood"
Open House New York, "A Magnificent Penthouse on Madison Square Park"
The New York Times, "Another Real Estate Record. Go Figure." City Realty, "212 Fifth Avenue Offers Combo Unit to Satisfy Growing Demand for 5-Bedroom Homes"
Polo & Lifestyle Magazine, "New York City’s Most Prestigious Address"
Galerie, "The 9 Most Expensive Penthouses in New York City"
Art of Living, "The High Life: Five Impressive New York City Penthouses"
City Realty, "NYC's Top 25 Best-Selling Buildings and Priciest Sales of 2018"
The New York Times, "The New Normal: It’s a Buyer’s Market"
Real Estate Weekly, "Julia Boland Sets Up Her Own Charity; Putting Others First at Crown Penthouse"
The Financial Times, "Can Millennials Save New York’s Midtown?" The Real Deal, "The $74M Penthouse at 212 Fifth Just Got a Price Cut"
Crain's, "A Manhattan Penthouse Faces Reality, Cuts Price to $62 Million"
Curbed New York, "212 Fifth Avenue’s Lavish Penthouse Returns with $11M Price Cut"
Bloomberg, "A Manhattan Penthouse Faces Reality, Cuts Price to $62 Million"
NBC Open House, "Home Tour: High Drama Franklin Street Loft"
Elite Magazine, "The Muse - ICOA Fundraising Music Appreciation"
New York Post, "Diane Lane makes power plays on ‘House of Cards’ and ‘The Romanoffs’"
Real Estate Weekly, "Have You Heard? Daddy Dunham Displayed in Fifth Ave Penthouse"
New York Lifestyles, "Around Town: NoMad"
Unique Homes, "The Ultimate in Luxury Real Estate"
Business Insider, "See inside the 15 most expensive penthouses for sale in America"
Curbed New York, "NYC’s 25 most expensive homes for sale"
The New York Times, "April's Most Popular Properties"
Variety, "Bill Lawrence & Christa Miller Pick Up New Condo in Manhattan Office Building Conversion"
City Realty, "Easter Week Saw 26 Luxury Contracts Signed, Tied for 2015's Record"
City Realty, "Mapping NYC's Penthouses: Inside Look at the Most Desirable Top-Floor Apartments"
The Real Deal, "New Price, New Broker… New Layout?" 6 Sq Ft, "Art and Real Estate: The New Relationship That’s Selling Big"
Mansion Global, "Which Penthouse Comes Out on Top?" The Wall Street Journal, "Which Penthouse Comes Out on Top?" 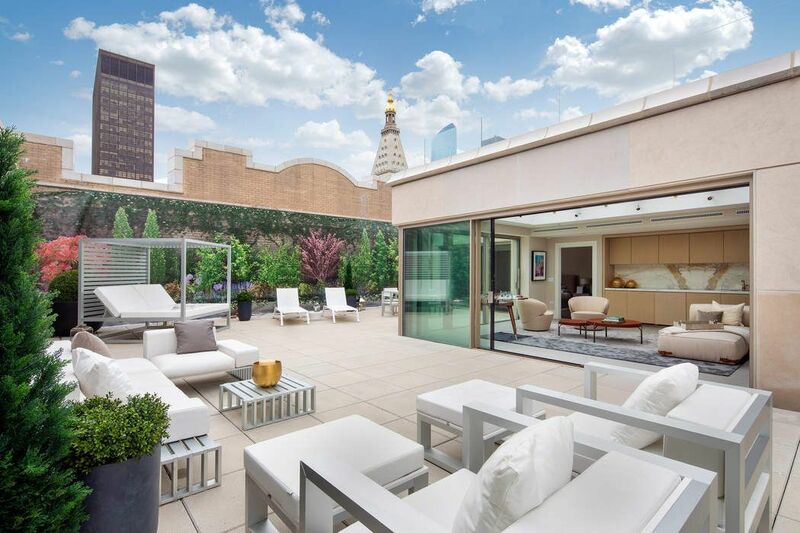 The Real Deal, "Will Fewer Showings, No Pool and No Staging Sell a $74M Penthouse?" New York Observer, "Can a Few Stunning Pieces of Art Sell a Pricey Apartment?" Curbed New York, "Peek at the Amenity Spaces in Nomad’s Opulent 212 Fifth Avenue"
Page Six TV, "Unreal Estate"
The New York Post, "Sellers Add Art to Sweeten $74M Penthouse Deal"
The New York Times, "Prewar, With a Twist"
Buzzfeed, "Here's A Look Inside 16 Super Expensive Houses That'll Make You Say 'I Need To Be Rich'"
Extravaganzi, "212 Fifth Avenue 'The Crown' Penthouse is Back with a Price of $73.8 Million"
Luxatic, "212 Fifth Avenue Penthouse is Back on the Market for $74 Million"
The Mann Report, "212 Fifth Avenue's Penthouse, The Crown, Hits the Market for $73.8M"
Robb Report, "A Fifth Avenue Triplex Penthouse Hits the Market for $73.8 Million"
City Realty, "New to the Market: Newly-Listed Condos with Beautiful Windows and Dramatic Views"
City Realty, "The Crown, Three-Level Penthouse at 212 Fifth Avenue, Hits the Market for $73.8..."
The Real Deal, "The Crown Penthouse at 212 Fifth Avenue is Back on the Market"
ABC News, "212 Fifth Avenue 'The Crown' Penthouse Hits Market for $73.8 Million"
Mansion Global, "Triplex Penthouse at 212 Fifth Ave. Returns to the Market—for $5 Million More"
A historic masterpiece of its time, the Crown Penthouse at 212 Fifth Avenue is in a class of its own and the most magnificent trophy residence on Madison Square Park. Designed by Pembrooke and Ives and spanning three floors, with over 10,000SF of living space and 5,730SF of terraces, this 5-bedroom penthouse has the majestic proportions of a palace. With four exposures providing 56’ of frontage along the Park and vistas of downtown Manhattan’s most coveted architecture, the pre-war details inside are equally matched with the iconic views revealed by its elegant arched windows. The foyer opens into a dramatic atrium with its breathtaking bronze staircase as its centerpiece. The Crown’s ceiling height, coupled with its gallery-sized walls, make this penthouse an art collector’s paradise. From the marble foyer with its private elevator, to the unrivalled grand ballroom, to the library with a marble and glass fireplace, to the sumptuous 7-room master suite – every detail was considered in its conception. The second level boasts a sky-lit entertaining space and colossal outdoor oasis extending the full length of the building. The 4700+/-SF terrace, with its copper molding and painstakingly constructed parapet provides unmatched privacy. The third-floor observatory opens onto a 950SF terrace with spectacular panoramic views of the Empire State Building, Flatiron Building and World Trade Center. All the finest quality materials, smart home technology and luxury amenities were incorporated to create a regal lifestyle for the first owner of this outstanding residence. 212 Fifth Avenue condominium is the unmistakable beacon on Madison Square Park. Amenities include: 24-hour doorman and concierge services, state-of-the-art fitness room, golf simulator, screening room, children’s playroom and more. Staff quarters and storage rooms are available for purchase. This is an opportunity of a lifetime. Sponsor. File No. CD15-0006.